Coco Curtain Studio & Interior Design was started by two women who shared a view that elegant fabrics and design should be available at reasonable prices for all with the highest level of personal customer service. 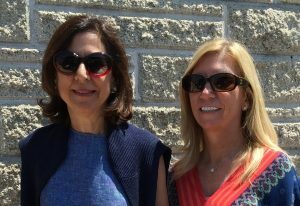 Joan Flynn and Mary Gorman each own and operate their own storefronts and collaborate on purchasing and fabrication to keep prices affordable, often purchasing in bulk and passing those savings to their clients. Their friendship was conceived while each owned a national window covering franchise in Devon, Pennsylvania and Ridgewood, New Jersey. In 2012, they decided to resign their franchise agreements and ventured out to open independent businesses, thus Coco Curtain Studio & Interior Design was born. The beauty of owning independent businesses gave them the opportunity to offer their clients full design services rather than just window treatments. Owning an independent business allowed them to decide which vendors to represent as well as the ability to offer extraordinary value!